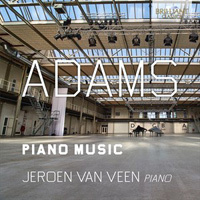 JOHN ADAMS (b.1947): China Gates, Phrygian Gates, American Berserk, Halleluiah Junction (w/Sandra van Veen [second piano]. Description: Both written in 1977, Phrygian Gates and its briefer pendant or companion, China Gates, were game‐changers for the course of Adams’s music. Phrygian Gates is a broad monolithic arch, roughly 24 minutes long, which is built upon a plan that resembles the classic ‘tour’ of the twelve keys, while entirely confined to the Lydian and Phrygian modes of ancient music. From almost 20 years later, Hallelujah Junction takes a fifteen-minute tour d’horizon of Adams’s own journey as a composer: at first ingeniously Minimalist, growing into a Romantic central section before coming around to a jazzy conclusion of unstoppable momentum. American Berserk (2001) sounds more ‘modern’ still, but its rhythmic complexities look back to American masters such as Ives and Nancarrow. Jeroen van Veen (piano).